Mesh your creativity with convenience and use JAM's Mesh Zipper Pouches! 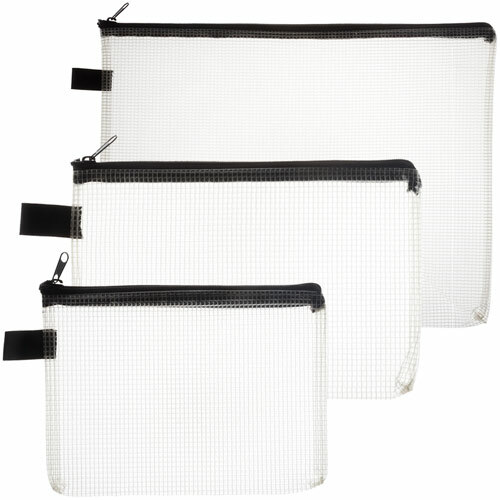 Each pouch features a unique clear mesh material and an easy-to-use zipper closure. Mesh Zipper Pouches currently come in 4 different sizes! Use the Extra Small pouches for pens, clips, pencils, coins, and more! The Small size pouch is similar to the extra small in size, but gives a little extra room for convenience. The medium size allows you to store larger items like index cards, markers, art tools, and scissors. The Large size pouch is where things really heat up. Store your most important letter-size documents and anything else you can think of in these 10 1/4 x 13 1/2 size pouches!